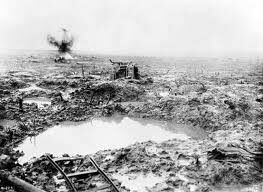 The horror of World War One trench warfare can never be truly felt until one visits the sites where so many young men suffered from disease, poison gas, countless deadly shells of all types and sizes, and harsh natural elements. High-ranking officers led them to slaughter, considering them nothing more than cannon fodder. In one battle, more soldiers drowned in the holes made by shells than were killed by the horizontal rain of enemy fire. Their commanding general had ordered them to attack after three days of pouring rain. At the same time, back on the home front, the war was advertised as an exciting heroic adventure that no young man with honor could turn down. Recruits and their families had no ideas what was waiting at the front. Graphic artist Max Gebhard recalls John Heartfield's sudden appearance at a meeting of the KPD in 1925. "Heartfield was not there. It took at least ten minutes, and then he suddenly surfaced. His entire body was shivering. One could sense his agitation, and he was quickly asked: 'Johnny, where have you come from? Where have you come from? Where are you…?' [John Heartfield replied] 'I was at the battlefield. I had to see where it happened. I need this for my work…I had to experience this. '…He shivered over his entire body and he could barely speak from the distress of these experiences."